Followers of the Church of Elon will no doubt already be aware of SpaceX’s latest technical triumph: the test firing of the first full-scale Raptor engine. Of course, it was hardly a secret. 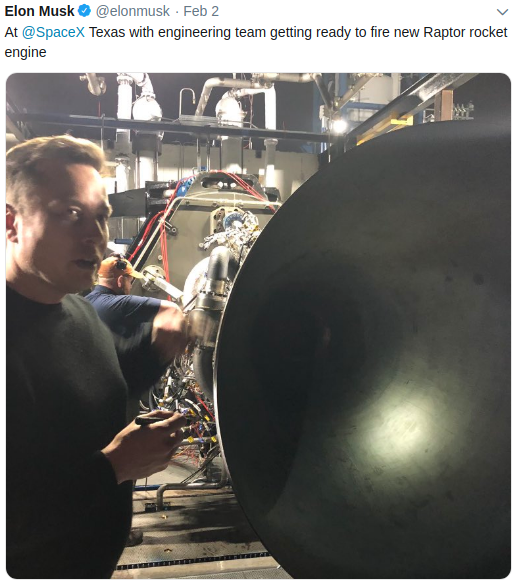 As he often does, Elon has been “leaking” behind the scenes information, pictures, and even video of the event on his Twitter account. 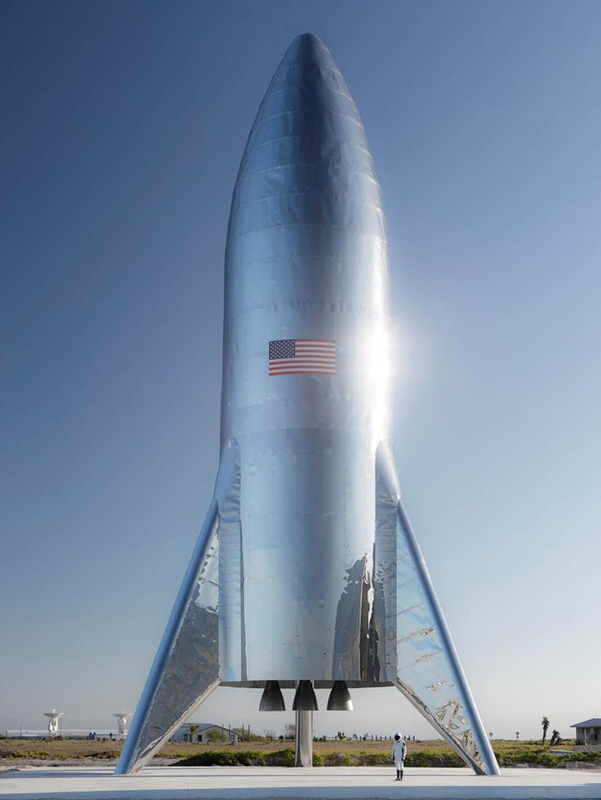 Combined with the relative transparency of SpaceX to begin with, this gives us an exceptionally clear look at how literal rocket science is performed at the Hawthorne, California based company. This openness has been a key part of SpaceX’s popularity on the Internet (that, and the big rockets), but its been especially illuminating in regards to the Raptor. The technology behind this next generation engine, known as “full-flow staged combustion” has for decades been considered all but impossible by the traditional aerospace players. Despite extensive research into the technology by the Soviet Union and the United States, no engine utilizing this complex combustion system has even been flown. Yet, just six years after Elon announced SpaceX was designing the Raptor, they’ve completed their first flight-ready engine. The full-flow staged combustion engine is often considered the “Holy Grail” of rocketry, as it promises to extract the most possible energy from its liquid propellants. In a field where every ounce is important, being able to squeeze even a few percent more thrust out of the vehicle is worth fighting for. Especially if, like SpaceX, you’re planning on putting these new full-flow engines into the world’s largest operational booster rocket and spacecraft. But what makes full-flow staged combustion more efficient, and why has it been so difficult to build an engine that utilizes it? To understand that, we’ll need to first take a closer look at more traditional rocket engines, and the design paradigms which have defined them since the very beginning. Many of the best known rockets to have ever flown have used engines based on what is known as the gas-generator cycle, including the Saturn V, the Soyuz, the Delta IV, and even the Falcon 9. In fact, outside of the Space Shuttle, you could probably argue that nearly every milestone in the history of spaceflight was made with a gas-generator cycle engine. It’s a technology that dates back to the V-2 rocket, and is one of the key breakthroughs that made liquid-fueled rockets possible. But despite its incredible success, the technology is not without its faults. Put simply, the gas-generator produces the gasses that spin a turbine, which in turn drives the propellant pumps. In some engines, the gas-generator operates on a different principle than the engine itself and has its own separate fuel supply. For example, the turbine of the V-2 rocket was spun with steam created by the chemical reaction between hydrogen peroxide and warm sodium permanganate. The downside of this method is that the secondary fuel system for the gas generator adds additional weight and complexity, the last thing you want on a rocket engine. The more modern approach, used in engines such as the Falcon 9’s Merlin, is to power the turbine by burning a relatively small amount of the same fuel and oxidizer as the primary engine. In this case, the gas generator is usually referred to as a preburner. But if the preburner was given the same fuel and oxidizer as the engine itself, and at the same ratio, it would essentially just be a smaller rocket. The exhaust would be far too hot to run through a turbine. To get around this, the preburner is run on a fuel-rich mixture which leads to incomplete combustion and lower exhaust temperature. The defining characteristic of what’s known as an open cycle engine is that the exhaust from the preburner gets dumped overboard as a waste product. In some rockets this unburned fuel can be seen as a black streak alongside of the otherwise bright exhaust plume. It’s never been a secret that there were performance gains to be had by closing the cycle, that is, capturing the preburner exhaust and feeding it into the engine’s combustion chamber. But the sooty exhaust produced from the unburned kerosene is unsuitable for recirculating through the engine. It ended up being easier to simply build larger rockets than try to capture this lost fuel. In the 1950’s, Soviet scientists came up with something of a compromise. Instead of using a fuel-rich mixture in the preburner which produced an exhaust that couldn’t be safely recirculated into the engine, they experimented with running the preburner oxygen-rich. Unfortunately this idea solved one problem while creating another, as there was no metal that could survive the incredibly hot oxygen-rich gas produced by the preburner. In fact, American scientists had deemed it impossible, and believed claims that their Soviet counterparts were working on the concept to be Cold War propaganda. Eventually the Soviets mastered the metallurgy required to build the turbine and developed several engines that operated on the oxygen-rich preburner concept. The exhaust was piped into the engine’s combustion chamber and recovered at least some of the propellants which would otherwise have been dumped overboard. The modern day Russian RD-180 engine, currently in use by the American Atlas V, is a continuation of this technology. American engineers went in the opposite direction. They believed that a fuel-rich mixture in the preburner was possible and could be done with existing metal alloys, so long as hydrogen was used as the fuel instead of kerosene. This ultimately lead to the development of the Space Shuttle Main Engine, which to date remains the most efficient liquid fuel rocket engine ever flown. While the Space Shuttle has long since retired, a variation of the engine itself will go on to power the Space Launch System. It will be the most powerful rocket NASA has ever built and is slated to begin missions in 2020. Either approach, whether it recaptures the oxidizer or fuel rich preburner exhaust, is clearly an improvement over dumping everything overboard. But neither is an ideal solution as there’s still potentially combustible products being wasted. Essentially the Soviet Union and the United States had both solved different halves of the same problem; to truly close the cycle, the fuel-rich and oxidizer-rich preburner designs would need to be utilized simultaneously in the same engine. The logical end result is the full-flow staged combustion engine. Such an engine has two independent pumps for oxidizer and fuel, spun by two turbines powered by their own dedicated preburners. But unlike the gas-generator cycle which burns just a small amount of fuel and oxidizer in the preburner, in a full-flow staged combustion engine, all of the fuel and oxidizer is run through their respective preburners. In other words, the fuel is burned twice: once at a lower efficiency in the preburners to produce energy for spinning the turbines, and again at maximum efficiency in the combustion chamber to produce thrust. While an exceptionally difficult engine to design and test, it completely eliminates the waste of the gas-generator cycle. But increased fuel efficiency isn’t the only advantage to this design. For example, the seals separating the turbine and the pump are less critical, as there’s no concern of contaminating the pumped liquid; ultimately they’re going to the same place. In addition, the fact that the fuel and oxidizer enter the combustion chamber as gasses further improves engine efficiency over conventional designs which spray them in as liquids. The individual turbines on a full-flow staged combustion engine also tend to run cooler and at lower pressure than the single turbine used in a conventional rocket engine. This puts less stress on the turbine impellers, and should allow them to run for longer before they need to be inspected and replaced. Given SpaceX’s focus on reusability, this is likely seen just as important as the increased fuel efficiency. While it will be the first one to fly, the SpaceX Raptor isn’t actually the first full-flow staged combustion engine to be built. The RD-270 was completed in 1967 by the Soviet Union as part of their program to reach the Moon, and performed several static test burns. But after the United States landed on the Moon in 1969, effectively winning the Space Race, the engine (and the rocket it was meant to power) was canceled. Less complex, and ultimately cheaper, engines were used for the remainder of the Soviet space program. In the 1990’s, the United States Government expressed an interest in the development of a domestic full-flow staged combustion engine. While there was promising turbine and preburner development by contractors Rocketdyne and Aerojet, neither the Air Force nor NASA chose to provide the funding that would have been required to complete the entire engine. So when will Raptor finally become the first full-flow staged combustion engine to leave Earth? If you believe Twitter, very soon. Elon Musk claims a prototype of the Raptor-powered Starship will be making low-altitude “hops” around their test facility located near Brownsville, Texas within the next couple of months. Of course a lot can happen between now and then, so it’s entirely possible that date may slip. But even still, it seems like 2019 will finally be the year that the “Holy Grail” of rocket engines finally takes to the air. Here’s hoping its been worth the wait. In his stationary hand is an electrical tester or soldering iron? and his blurry hand is a ratchet? so then the blurry hand is a rag cleaning the spot hes going to sign? that actually makes sense and sounds like something he would do. good spot! It’s a flashlight. You can see the spotlight inside the raptor’s bell. LED flashlight. He’s closer to the camera, and the beam is the bright spot in the nozzle. You use the term fuel when you are talking about propellant. Propellants are the general term for the chemicals which the rocket runs on. But individually they are fuel and oxidizer. Those are called monopropellants – they either don’t run on a combustion reaction, or the fuel and oxidizer are pre-mixed. Hydrogen peroxide rockets run on a catalytic reaction with a silver mesh, which means the propellant isn’t an oxidizer because there isn’t any combustion happening: it’s essentially a “water” rocket, since the exhaust is hot steam. A very commonly used monopropellant is hydrazine monohydrate, commonly just called hydrazine because nobody is nuts enough to use straight hydrazine. Entirely unlike depicted in “The 100″ hydrazine monohydrate is a clear, oily liquid and extremely stable. There’s a paper online covering tests NASA did trying to get the stuff to detonate, including setting off a kilo (the document listed the amount in pounds) of C4 atop a stainless steel container of it and firing a 1/8” diameter aluminum projectile into the container at several kilometers per second. The 1980’s document uses both SI and Imperial units all over the place. Why go to all that testing in the 1980’s when the monopropellant had already been in use for a long time with an excellent safety record? Apparently someone somewhere demanded absolute proof the fuel was as safe as everyone using it already knew it to be. Hydrazine monohydrate is mildly toxic with minimal skin exposure. Getting a little on you once in a blue moon isn’t going to kill you or give you cancer. Getting a little on you every day for a while might. Breathing in any amount is not at all a good thing. Dumping a bucket in your lap would likely be bad, especially if your pants happened to act as a catalyst somehow. The liquid catalysts (one is red fuming nitric acid) used with it are worse than the hydrazine monohydrate. But the space industry is moving away from hydrazine monohydrate to a mix called Aerozine. It produces more thrust, is somewhat less toxic and has less toxic byproducts. As for the depiction on “The 100” I assume someone looked up rocket fuels, saw the specs for pure hydrazine and exaggerated by a factor of 10 or so. Very strange: Hydrazine(derivatives) and RFNA (red fuming nitric acid) are a well known hypergolic bipropellant system. How can RFNA act as a catalyst in this system when it is for sure consumed as an oxidizer together with hydrazine? Wikipedia describes Iridium used as a catalyst for hydrazine as monopropellant. The oxygen is the fuel. The oxygen gets oxidized to -2 in steam and reduced to 0 for molecular oxygen. Hydrogen stays at +1 throughout. Saying “the oxygen is the fuel” is akin to saying “the oxygen burns”. Oxygen getting oxidized? What am I misunderstanding? Thanks for that article. :) Learn a little more rocket science with each article. I don’t see, how a closed cycle staged combustion engine which uses either an oxygen rich or a fuel rich design wastes propellants. 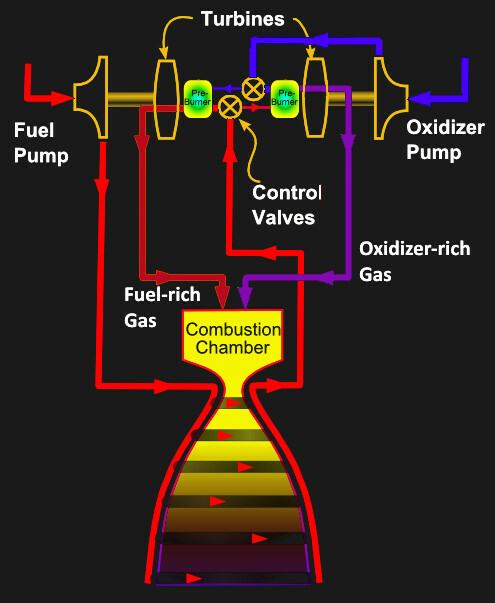 You do not dump hot gases over board if you use only one of the propellants to drive the pumps through a preburner. The full-flow design eliminates the problematic seals between hot oxygen rich gas and the fuel or hot fuel rich gas and the LOX. A non-full-flow staged combustion engine is limited by the temperature the turbine can withstand and thus is not able to extract as much energy from the propellants, thus cannot achieve as high chamber pressures as a full flow staged combustion engine can. Alternatively, for the same chamber pressure, a full flow staged combustion engine can operate at lower turbine temperatures, which enhances reliability, increases reusability, and/or reduces material costs. The highest chamber pressures mean the highest efficiency, and a full flow staged combustion chamber is able to maximize this efficiency to the very limits of what’s fundamentally physically possible given the material constraints of the turbine. Contrast this with a far lower performance electrically pumped engine (like what RocketLab and other such smallsat startups are using), which is severely limited by the energy density of its batteries (and whose weight is all wasted dry mass, not useful as a propellant). A full flow staged combustion chamber can literally achieve an order of magnitude higher chamber pressure (and thus an order of magnitude higher pressure ratio) while maintaining a much *lower* dry mass per unit thrust. What’s interesting, though, is Ursa Major Technologies ( https://www.ursamajortechnologies.com/ ) has a small oxidizer rich staged combustion engine that it has developed which it is offering for smallsat launch applications. More of that is definitely interesting. OK, I did not know that details. So “wasting” propellant not in the sense of dumping sooty exhaust but in the sense of not getting the max. possible performance out of it. Yes, this electric pumps are a strange development. Also dumping a lithium ion battery good for 1000 cycles after just one use. If you know you will chuck the battery after only one use, you can abuse it to hell and back – more discharge current, (very closely controlled) overdischarging right before the start and other shenenagans. Also you can use much cheaper cells that are do not have to sacrifice things you want (power, light-weight, capacity) for longetivity. Seems like a waste of electrons to go on the internet just to write that. To add to what Chris said, the independent fuel and oxidiser pumps also allow far quicker and more efficient tweaks of fuel/oxidiser ratio. Many designs do in fact do this. Check out the picture of the Merlin engine above and you can see the exhaust from the preburner to the right of the main engine nozzle. This is done because dumping that exhaust into the nozzle can cause problems with soot build up. In an oxidiser rich preburner you have problems with very hot oxygen rich gases burning through parts of your engine, so again, the exhaust is sometimes dumped. Not all engines dump their pre-burner exhaust, but for an engine designed for re-use it’s more problematic. SpaceX have picked pretty much the most difficult (but most efficient) way of solving the problem. Somehow. :-) But the result has been described as the similar to the output of a cutting torch: Blazing hot gas, consisting mainly of oxygen. So not the best environment for combustible elements like metals. There was a great piece in “amateur scientist” in Scientific American back in the 70s about doing this. year month of article. I sucked up most of the sci ami online pdf’s a while back ( when the portal is open for study break). I could cut and paste text here. Despite being a nerd, I’m not at all interested in astronomy and don’t follow space happenings. However, this was an absolutely terrific article. Good background, nice pacing, few wasted words. My grandson applied there, had high hopes, didn’t get in. Now the layoffs start.. I’m glad he’s not there. I worked there (the McGregor site, Merlin Stand). He didn’t miss much. Sure, fire and rumble is awesome, but the “science” isn’t really all that impressive. There are better “environments” to work in. This round of layoffs was big news because it was en mass, and unannounced. However, at least at the testing site, there is a steady turnover rate, intentionally creating about 10% attrition each year. Oh man, that sounds like a horrible, backstabbing work culture. Screw that!!! Knowing Elon that’s probably deliberate so those 10% of people can go off and set up competing rocket companies for the good of humanity! Burn and turn employment is never about creating competition for yourself. Very well written article that makes this complex topic very understandable for a layman. Thank you. I thought the gas generator is credited to Goddard and not the V2? So why don’t we use pressure fed engine? We do, just not for first stage engines. Maneuvering thrusters are almost always pressure fed for simplicity and fast response time. But a pressure feed system just can’t keep up with the propellant demands of a large booster engine. That being said, SpaceX used a pressure fed engine on their Falcon 1 rocket which was the first commercial booster to put an object into orbit. But it was pretty quickly abandoned for the Falcon 9 powered by Merlin. Falcon 1 used a merlin on stage one. Stage two? A tank that would have to withstand the chamber pressure has to be quite sturdy. A big (first or main stage) tank able to withstand something like 70 bar would be really heavy. That would mean (somehow…) pressurising the tanks to over 100bar (1450psi). It would also mean very bad things happening if you failed to keep the pressure up. The SRB has a lower working pressure (because it’s a solid fuel rocket) and the walls of the engine are over an inch thick steel. You can imagine how heavy that is. If Goddard rockets were only pressure-fed then what’s this thing? Just how impossible is it, on a scale of 0 to 420? If you just replace every instance of the word “impossible” with “impwahssibull” it increases the ease and depth of comprehension substantially. Then you can recognize that they all have the same value; 42. Or 0. Or 420. Or any other giggly number. Joe Friday’s badge number was 714. Since when is an open-cycle gas generator called a preburner? I’ve only ever heard that term when there was a post-burn involved, i.e. in staged combustion systems. The MVAC engine (second stage) directs the GG/turbine exhaust back into the engine (lower chamber, I think), rather than exhausting it like the first stage engine. Also, that GG exhaust isn’t a complete waste. It creates a few thousand pounds of thrust, too. You can’t really see it in the M1D picture, but the GG (mounted below the top plate, near where the yellow tube is connected to the O2 sensor) is not much bigger than a typical Coke can. I got to watch several tests of the GG when they were doing validations for the “slushy LOX” (densities propellant), and that baby is a 60-foot blowtorch as loud as a full engine. It’s amazing what kind of forces are produced “just for the pumps”. Note: I’m confident that Merlin engine is a flight M1D being tested in Merlin South Bay. From the instrumentation I can see in the picture, I was probably still at SpaceX when that pic was taken. From the camera position, that might be serial number 100. They didn’t use that camera position for very many flight engines (photo-op!). For most tests, while I was there, I would have been about 230 yards to the right of that engine, just outside the QD. The MVAC engine doesn’t direct the GG exhaust back into the engine chamber, instead it collects exhaust gases inside the TEM and evenly distributes it around the nozzle and those gases exit the TEM at the nozzle exit through the restrictor ring. With that said, the exhaust gases are still dumped off, the only difference is that the gases are dumped off evenly around the nozzle which allows for additional thrust. I agree with the OP, never have I heard of a GG being referred to as a preburner. Very well written and interesting article! Only in the rocket engineering dumping billions of Joules in open flames and hot air gasses can be considered “increased fuel efficiency”. The crazy thing is that the conversion of chemical to mechanical (jet kinetic energy or shaft power) is actually much higher for a rocket engine like Raptor than a typical internal combustion engine like in a car (~15-25% efficiency). With a 3.8 oxygen to methane (55.6MJ/kg) mass ratio, at sea level Isp (330s) Raptor is 45% efficient at converting chemical energy to mechanical. At high altitude (362s) the same engine is 54% efficient and with a vacuum expansion nozzle and vacuum-optimized (382s) it’s a whopping 60% efficient. *Youtube video about a plant going up during a fire. 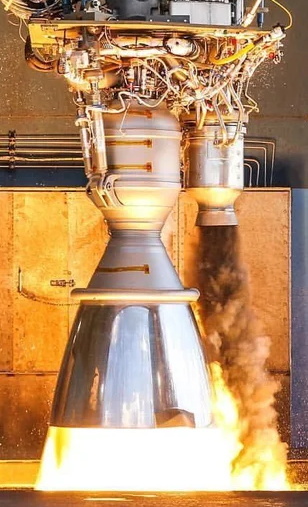 That’s a solid rocket motor propellant plant; SpaceX doesn’t use any solids on their rockets. For Raptor, SpaceX just uses methane, which is almost straight natural gas. Comes almost straight from the ground with probably less energy input than used to make the gasoline in your car. And it can also be made from in situ resources, i.e. air and water, using solar power (in fact, this is essential on Mars although SpaceX is also developing the ability to do it on Earth as well). That’s a large reason why SpaceX decided on this propellant combination to begin with. I never realized that it takes SO much energy to go to space. Just a stupid question, why don’t we use some kind of “magnetic slingshot” to help with the ground take off? Too much stress? Not accurate enough? Would need even more energy (even if this energy stays en earth and allows more fuel to be used by the rocket)? The article itself is wonderful too! It makes me want to know more. Several years ago, I attended a launch at Edwards Air Force base, using a plane to carry the rocket to altitude, the shoot it higher. Today, even larger systems are being built. Yeah Earth is a really inconvenient planet for space travel. If it was a little bigger, human spaceflight would be almost impossible. Granted, I think they are counting on the flights to Mars carrying a lot more payload than the ones coming back. “Raptor is 45% efficient at converting chemical energy to mechanical” that is an interesting statement. With it you are signing for the conventional view of the rocket engines efficiency. My point was though, that there are more efficient ways of moving masses in a fluid environment as air, then just pushing ON the air directly with the thrust of the burning fuel and this is what the rocket engines measurement for efficiency does not take in account. Of course that is true only for the lower part of the (any) atmosphere, were we have dense air. For example, considering that for lifting 1kg to 1m height the energy consumption is 9.8 J ( approximately 10, for the sake of easy computations ). 1000 ton mass to be lifted to 10 km height, theoretically requires 100GJ energy, or approximately 2000 kg from (55.6MJ/kg) fuel mixture. That will require approximately 5m^3 methane and about 19m^3.oxygen. Now that fuel can be placed in 2x2x6 m, and that is ALL the fuel (that is required to lift that mass to that height. Great summary of rocket development. Thanks! Check out the 2008 documentary “Cosmodrome” Now on Netflix. It gives firsthand accounts of the Soviet development of the preburner technology innovations present in the RD-180. Thanks for the Netflix tip. Interesting show, and also probably one reason why Elon first went to Russia looking for engines. This article is cool too, I especially like how it said each country perfected one half of the full flow engine. That could have been the plot to an original Star Trek show, – the stupid alien planet that could have colonized space if only their competing countries had cooperated. A good documentary on the old Soviet engines is “The engine that came in from the cold”. The unused engines from the failed N-1 moon rocket program were ordered destroyed, along with all the plans and the rest of the hardware. The scientists hid the engines and some other stuff in a warehouse then kept quiet about it all for many years. After the breakup of the USSR, some of the engines were sold and refurbished. Some worked for rocket flights, some, despite very thorough inspection, repair etc, exploded – same as they tended to do on the N-1. Soviet metallurgy quality control of the late 60’s and early 70’s was pretty poor. Those old engines while a great technical achievement are just too risky to actually use, even for unmanned rockets. Saving a bundle using an engine mostly built 40 years ago is great, unless it happens to be one with a flaw in the combustion chamber that X-ray, magnaflux, sonic and other tests can’t spot. Thank you for this article! For a casual Spacex fan with no understanding of rocket design, this was very informative. Aerojet had an interesting solution to wasting the exhaust from the turbopumps on their M-1 design. Make them super powerful then run their exhaust out through a ring of nozzles around the bottom of the engine bell to produce several thousand pounds of additional thrust. The F1 had good efficiency because the GG exhaust was fed into the nozzle perimeter. Some additional oxidation could occur, it expanded in the nozzle to optimize thrust production, and it cooled the lower bell, eliminating the need for a tubular wall with fuel cooling. I’m going to call you on that and ask what style guide that is according to? First, it is spelling, not grammar. And second, even the website grammarist dot com admits that the verb “gasses” is so rare that “the rare instances of gasses we find on the web are mostly variants of gases. There is one of these for approximately every ten gases.” This means that “gasses” is a well-known spelling of gases, and if you understand how dictionaries work, that also means it is correct, if not the most popular spelling. Remember, dictionaries are not authorities; they are lists of known published examples, filtered subjectively by the publisher. Dear “Your English teacher”: Actually, gasses and busses are acceptable spellings of the plurals–just less commonly used. Perhaps you need a more complete dictionary. I don’t think this is the case. The Soviet/Russian NK-33 engines are closed cycle and TsSKB-Progress and area already used in the first-stage of the lightweight version of the Soyuz-2-1v. So…you didn’t actually understand any of this article I’m guessing. What the details attempt to explain is that the NK-33 are only partially closed-cycle. The block diagram appears to close the cycle, but the usage efficiency on the pre-burnt fuel is still reduced. If you dump the stuff that is wasted in open-cycle through the same exhaust as the main fuel, that doesn’t automatically make it closed-cycle or full-flow, you’re just bundling the flows in a way that makes the block diagram appear closed. This is what the NK-33 does; it recovers part of what is wasted in open-cycle. The NK-33 and the Space Shuttle both recovered part of the wasted fuel using very different techniques; this design achieves both of those techniques together, which is what makes it the first full-flow closed-cycle staged combustion engine. The NK-33 is not a full-flow engine. What efficiency increase do you get with a full flow compared to an open cycle? I have yet to see how this will benefit the average user. M.ade A.nother G.reat A.rticle!!! Great read sir. Def peaked my interest. Goes great with series I’m watching on Netflix (Mar’s). Keep them coming cause you keep me coming back. Need to mention the IPDE or integrated powerhead demonstrator engine as it was the first full flow combustion engine in the US. They got as far as the per burner and turbo pumps but the full engine was never finished because funding was cut. I think it probably had a lot of influence on Raptor’s design as Spacex might not have attempt to make a FFSCC engine if a lot of the concepts were not proven on IPDE. The original plan was to build Merlin 2 which was a F1 sized engine based on one of Tom Mueller’s earlier engines the TR-107. I just got back from a SpaceX tour. My son is an Senior Software Engineer with them and conducted the tour. I was very impressed by their production, surprised we were able to get as close as we did. They seem to be doing a lot of innovate things.